This is an exceptionally rare early 19th Century household cavalry trooper's sabre, circa 1808 to 1818, with battle damage from the Napoleonic Wars, almost certainly Waterloo. Very rare heavy cavalry sabre of the household cavalry (Royal Horse & Life Guards) made between 1808 and 1818; damage to the blade indicating it was decommissioned after being damaged in battle. This sabre is so rare it does not appear in many reference books (because the authors can not get their hands on one to photograph and because it was not an "official" pattern per say), but it does in the all important "Swords of the British Army" by Brian Robson. This "pattern" of sword was never an official pattern such as the 1796 P heavy cavalry sabre used by regular regiments. 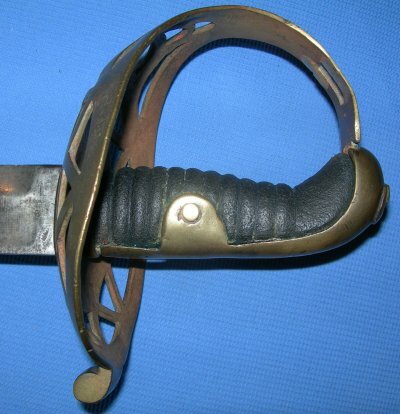 The brass hilted household cavalry sabre clearly mirroring the grandeur of the French cuirassier sabre's brass hilt. However, this household cavalry pattern was less effective than the steel disc hilted sabre issued to regular troopers in Dragoon Guard, etc. heavy regiments because a) it is slightly heavier (making it hard to hold in charge position, arm outstretched) and the hilt was much weaker defensively. Collectors and experts debate when this sabre was actually carried by household cavalry troopers due to paintings of a few just before and after Waterloo clearly showing the standard steel disc hilted version. However this sabre indicates it was at Waterloo simply because its original hatchet point has been ground down to spear point, which was a field order given by the British commanders just before Waterloo (caveat: not all British heavy cavalry sabres were ground down to spear point in time for the battle). In addition, records exist which indicate this sabre was still being made at the time of Waterloo (with a hatchet point) and just beyond, 1818; the pattern being officially replaced in 1820. It is difficult to imagine the cash strapped British army ordering a sabre which some say was obsolete at the time! So, on this basis, given the spear point, the blade damage, the fact all the household cavalry regiments were at Waterloo and fact this sabre pattern was still very much alive at that time, I am very confident this sabre was involved in the famous cavalry charge by the Household Brigade on one side and the Union Brigade the other. The 34 and a bit inches blade clearly has lost nearly an inch in length and I suspect not just from the tip being modified to spear point (this might explain half and inch loss). Given the blade is bent in a couple of places, I suspect the tip was ground once to spear point and then again to take off battle damage. The forward cutting edge section has some pronounced nicks to the blade indicating close quarter battlefield action. In any event, this blade has seen action, for sure, and the spear point indicates it was at Waterloo. The blade appears to have the remnants of a maker's name to the spine, but as I can clearly see an "8" I am pretty sure it was made by Osborn of Birmingham as they were given this number in the original inspection / view mark issue. The hilt has cuts and some (repaired) breaks to it as you have to expect, though is in very good order considering. The grip has been replaced with a modern composite material (professionally done). The blade is firm in the hilt. 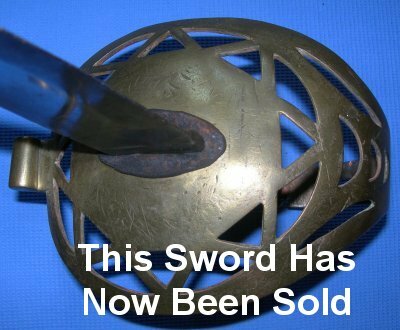 Given the incredibly rare nature of the sabre, I believe the price is exceptionally good. Further / larger photos available upon request. Item reference number 97 (107).